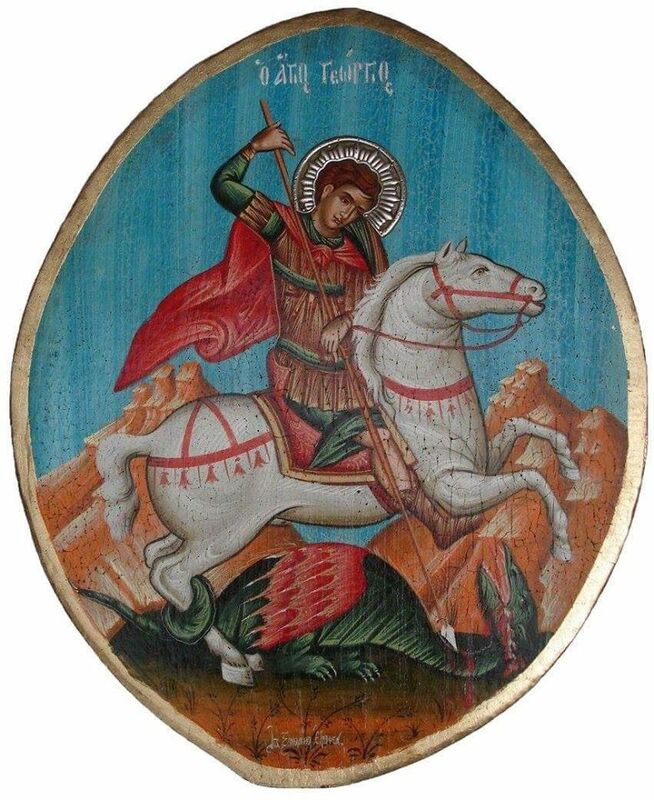 For St. George’s Day (April 23), some images of the saint. My thanks to everyone who sends me these! 1. 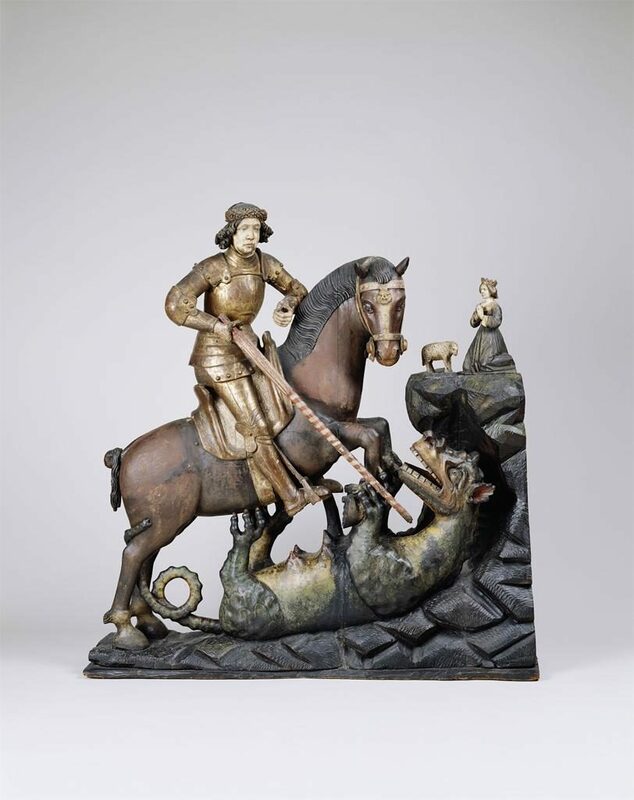 Courtesy Wanda Cronauer, a Greek St. George in action, from the Jerusalem Art Museum. I have never seen an oval-shaped icon before (if this is an icon). 2. 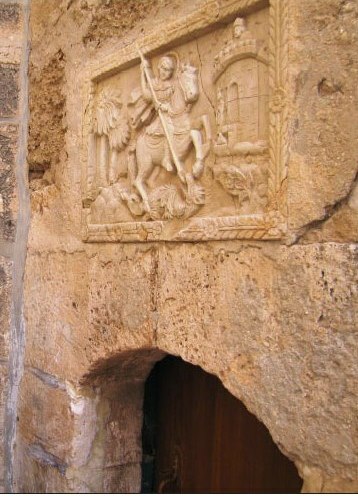 Also from Wanda Cronauer: a sculpted St. George with plate armor and a flowing cape, in the Church of the Nativity in Bethlehem. 3. I took this photo at the Art Gallery of Ontario in 2014, and I found it in their online catalogue. 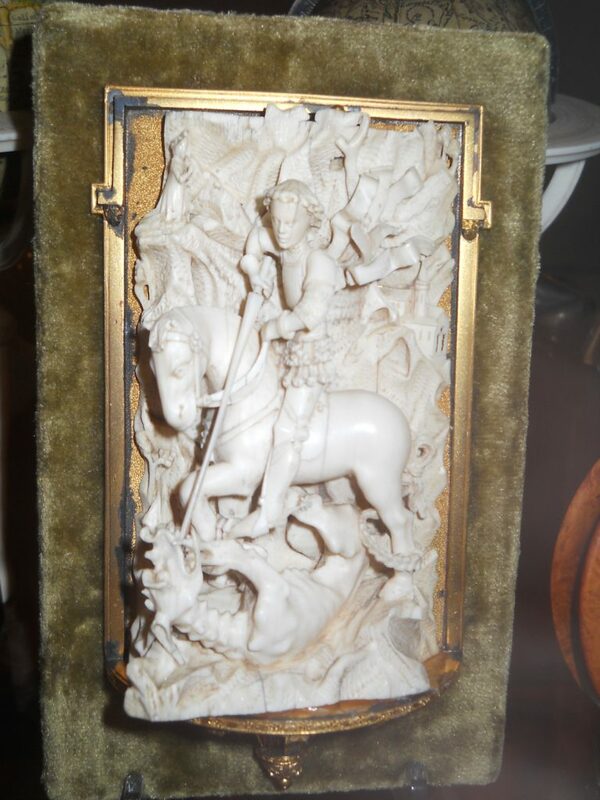 This ivory St. George was made in Cologne or Burgundy, although the AGO does not proffer a date when. 4. 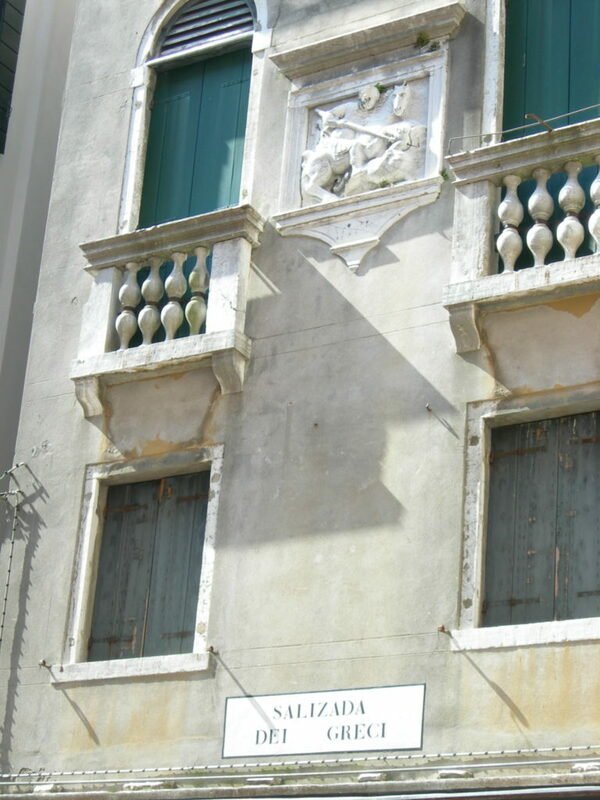 Here is a bas-relief St. George in Venice. My friend Anne Delgado sent me this. 6. 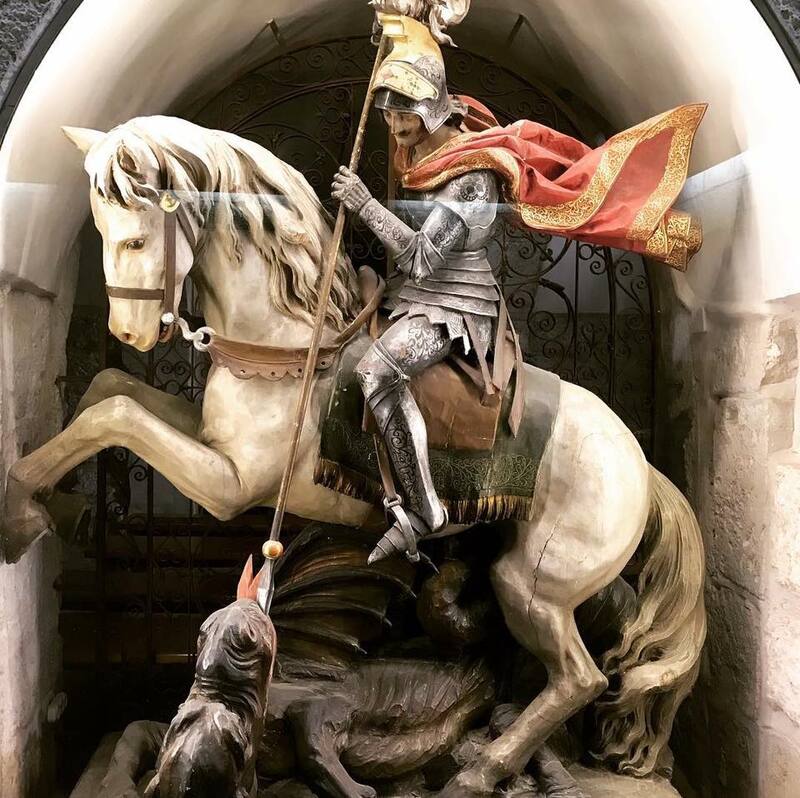 My friend Brad Adams and his son beneath Donatello’s St. George sculpture in Florence. 7. 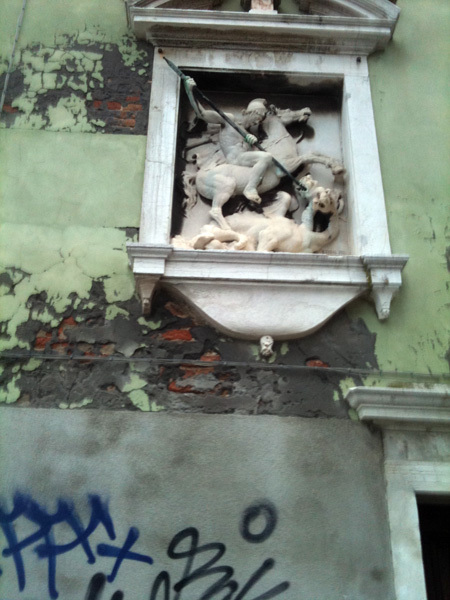 Brad also sent me this St. George (and graffiti) from Venice. 8. My friend Todd Harper took this photo at Montepulciano, Italy, last June. It is by Angelo Righi (Orvieto, 1587-1603). The dead bodies in addition to the dragon are a nice touch. 9. 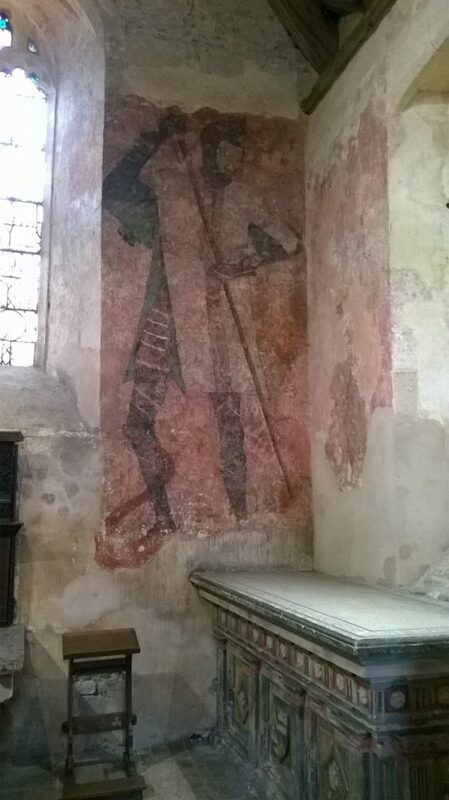 My friend Malcolm Mercer sent me this photo of a medieval wall painting at Hungerford, Berks. 10. 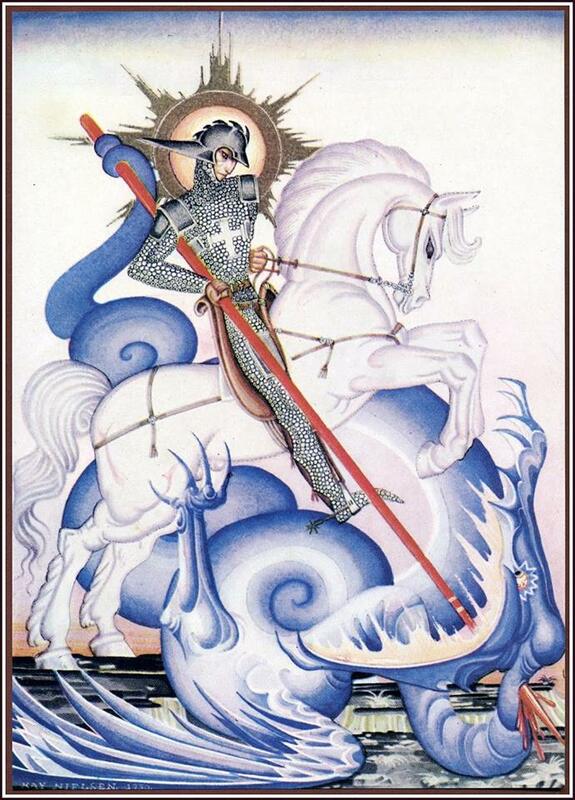 An illustration by Kay Neilson from the book Red Magic: A Collection of the Worldʻs Best Fairy Tales from All Countries (1930), sent by my friend Chris Berard. 11. From the Birmingham (Ala.) Museum of Art, sent to me by Ken Wheeler. 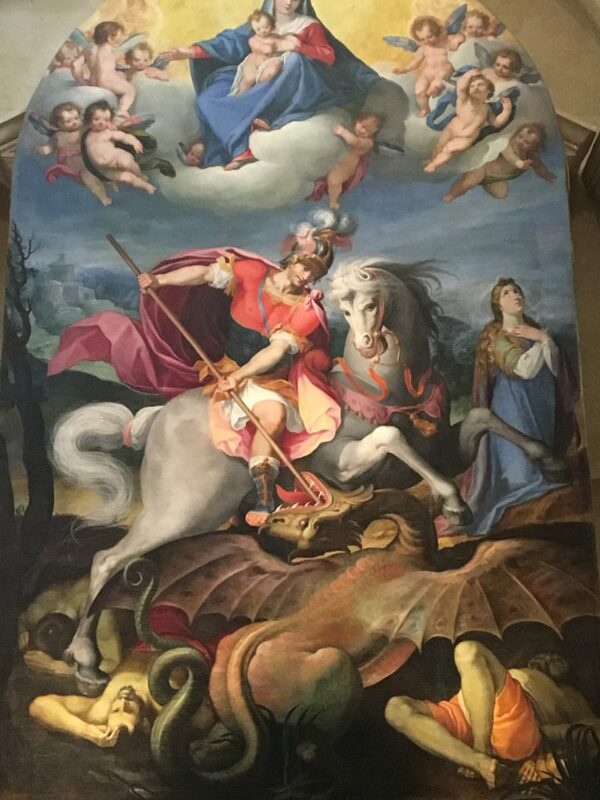 The dragon’s teats suggest that it’s female; Samantha Riches has a lot to say about the gendering of this legend in her St George: Hero, Martyr, Myth (2000). 12. 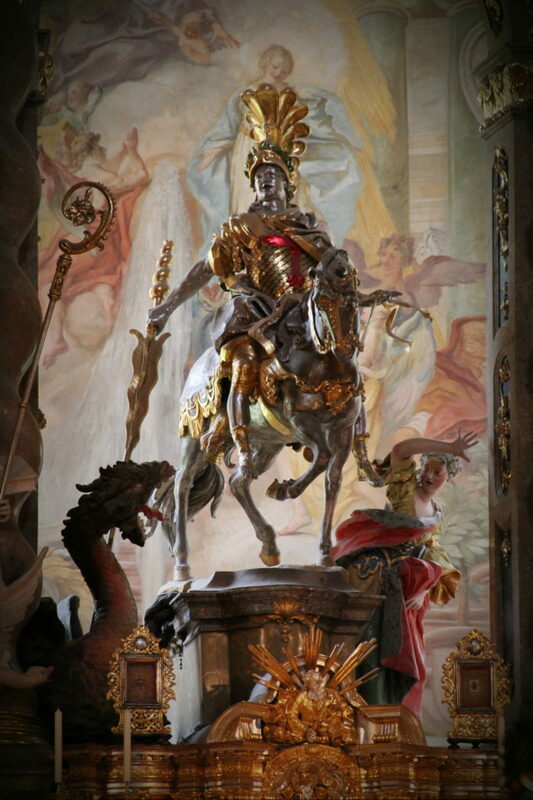 “Klosterkirche St Georg und Martin, Weltenburg, Lower Bavaria, Bavaria, Germany” – shamefully, I cannot remember who sent me this. 13. 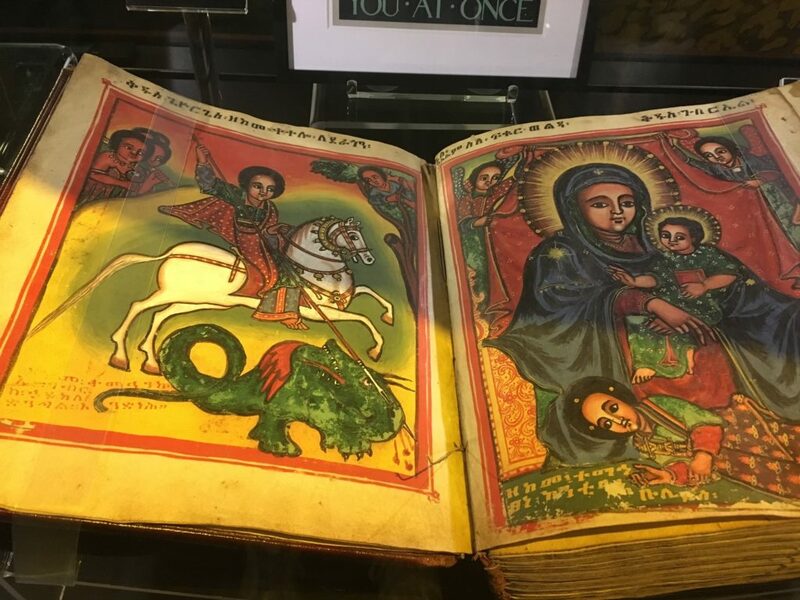 An Ethiopian St. George on display in the Creation Museum (Petersburg, Ky.), courtesy Ruth Mattson. Far-right Viking medievalism is not about historical accuracy. Rather, it’s used to create narratives. So, to resist the medieval narratives that activate violent hate, we must create counternarratives — and to do that, we must understand the real Viking past and how it has been weaponized. I repeat my idea that academics should seek the truth as much as possible. If people want to idealize a historical era for their own reasons, that has nothing to do with us. Or rather, we should keep on doing what we’re doing, gently correcting any misconceptions out there as we discover them. 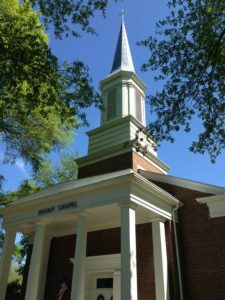 Constructing noble-lie “counternarratives” is just as bad! If it’s bad, say, to elevate the Greeks as the fountainhead of all that is good about Western Civilization, then accusing them of stealing everything from the Egyptians isn’t any better. 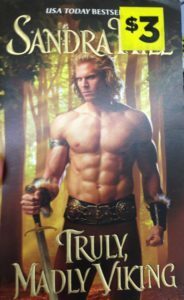 Here is a proper use of the Viking past, snapped at a local Dollar General. 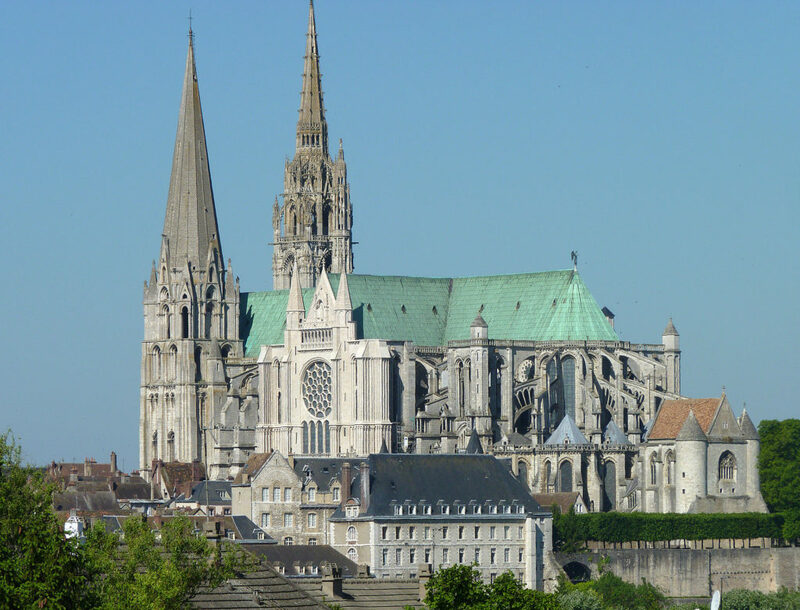 Everyone knows the cathedral of the city of Paris as “Notre Dame,” but there are approximately sixty French cathedrals dedicated to some aspect of “Our Lady.” One of these is Chartres, probably the most famous French cathedral after Paris. Chartres Cathedral from the southeast. Wikipedia. “Charpente de fer,” Chartres Cathedral. Wikipedia. 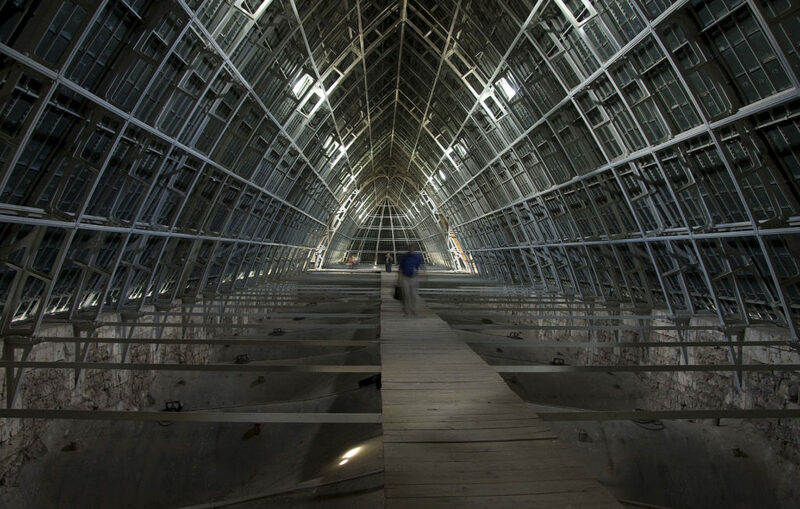 A view of the interior of the roof space, which looks like a twenty-first century airport concourse, but in fact dates from the early industrial age. Presumably it is also more fire resistant, and a model for what could be done with Notre-Dame de Paris. 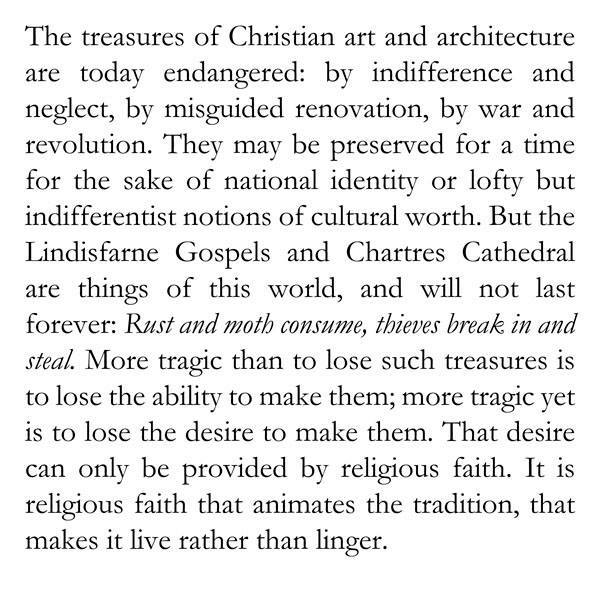 I confess that I don’t much care for calls that the rebuilding of Notre Dame should “reflect today’s multicultural France.” It’s a medieval Gothic cathedral, and remains a locus of Christian worship! That it is also a tourist attraction is of distinctly secondary importance. Please, let’s save the starchitect glass pyramids and “crystals” for other, less significant buildings.